Having played in a variety of blues bands throughout his teen years -- including The Jaybirds, which had gained some regional popularity in England and Germany -- Alvin Lee's real success came after The Jaybirds changed their name to Ten Years After. The renamed band made an impressive showing at the 1967 Windsor Jazz & Blues Festival and went on to broaden their fanbase through endless touring. The primary focus of the band was Alvin's skillful and blisteringly-fast guitar playing, which blended aspects of blues, jazz and rock techniques -- playing prominently featured during Ten Years After's career-making performance at the Woodstock Festival in New York. 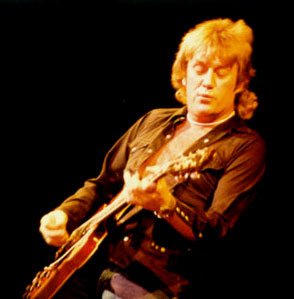 Ten Years After continued to record and tour until 1975 when the band was dissolved. Alvin performed for a while with a self-named ensemble, and later with a rock trio named Ten Years Later, but the original line-up has since become active on several occasions up through the 1990s. Numerous solo projects have taken place between periods of band activity, including collaborations with George Harrison, Mick Taylor, and Scotty Moore.